A simulated chill ran throughout his body, the voice was something he thought had vanished or silently destroyed by the faction known as the Hand. He had caused a galactic stir, far greater than anything Ryan had seen in recent years, and the most recent sighting was Corellia. Ryan hesistated, Damian's innocent eyes pouring over the communication device and unbeknowest to Arlyn and Ryan, he too recognized the voice that echoed from the channel. The voice had stopped, the effect still taking it's toll on members in the room, with the quiet glow of the Rambaldi box. Eve, the undetectable connection the two had shared, spoke, "Trace the signal." Ryan moved towards the panel, his fingers wildly smacking the keys as the program started the trace. Yoogle opened his eyes, something was happening to Arlyn, Ryan and Damian, yet, it was not his place to interupt. At least, not at this time. The lost Jedi of Salo Daast had finally been reclaimed. With his full party onboard, Yoogle waited patiently for the return to Denon... in the meantime, he kept his mind open to the disturbance nearby. Caprician is now headed to Denon, all original members are onboard, in addition to NPC Salo Daast. His voice was calm, the time for this moment had finally come. The Hand had been waiting for the box to open, the beacon to be activated. And judging by the box's location, she was returning to Denon. Excellent. The man continued, "I have no doubt your husband is standing nearby, and it was one of your pathetic children that had activated the box." It was one of the three, most likely the eldest. Sark had little time to explain, even the most comprehensive tracers would track his location faster than he could finish. "I'll be seeing you soon, brother." Sark clicked the conversation, his own software alerting that something had traced him faster than he had calculated. The last word, brother, was directly meant to send Ryan's programming into a massive overload of fear. There was no doubt the whole family would feel this, especially after Sark's last contact at the Estate. Boarding a speeder, Sark had little time to move a recently acquired asset. Arlyn and her family are now on the surface. "Is she all right?" without further investigation as to who the Geonosian was referring to, the Human Replica Droid answered, "She'll make a full biological recovery. Set course for the pre-determined coordinates and make the micro-jump." "Thank you, ma'am. And Aye." The Caprician was brought about, before jumping to hyperspace. The Caprician is now en route to a classified location. The Caprician was orbiting the new world, it's sensors and droid fighters running across the atmosphere to scan for signs of remaining sentient lifeforms. Eve was ninety percent sure they would encounter very little, if anything, as the world had been deserted for several thousand years. Heels clicked on the ship's flooring, and through the cybernetic connection, Eve knew who would be standing next to her before the woman stopped. "Ophelia." Eve stated, "Our new home." The fellow Replica Droid was quiet, pondering the advantages and disadvantages of the world before her. Eve couldn't help, but wonder if the woman had missed her beloved Droid Control Ship, and the center of her entertainment. Her primary role had been terminated, and for that, Eve pitied her. The orb was vastly different from Origin Zero, and because of this, required a new designation that wasn't so militaristic. "I miss -" she started, before feeling foolish enough to continue the statement. For the first time since their arrival, Eve's eyes parted from the planet and stopped in front of the brunette. "I know. You were designed for that purpose. It's hard stepping away from your programming, and searching for something else. It's an endless void, but for now, you have your orders. We can reprogram your central system once my Supercomputer is safely on the surface." Ophelia was careful to agree, before departing from the bridge. Returning to the viewscreen, she stared and wondered what Denora was doing this moment. The Caprician slipped from hyperspace, it's timely arrival was perfect for Ryan's departure. 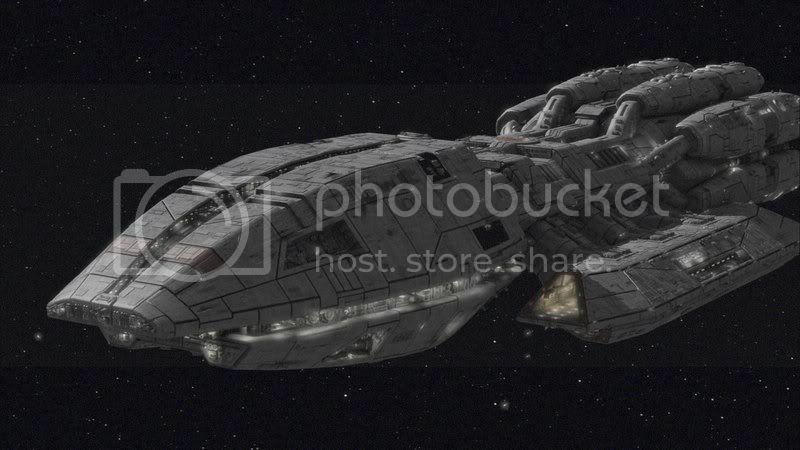 Only minutes passed as a shuttle docked with the massive battle cruiser, before it slipped away again. Damian's eyes scanned the vessel, he was not losing the opportunity to scan and collect the visual information that he was witnessing. It was one of the first times Arlyn or him had taken a child from their home, but Ryan wanted one of his sons to travel with him to their city. Whether Coronus was revealed to them or not in the future, now was a good time to set the feeling of security. It was a place of refuge. The carbonite crew member was stored, the cloth still resting over his body, as Ryan took his son towards their private quarters. It was a long trip, but the two would find enough things to occupy themselves with in the meantime. The Caprician has arrived at Coronus. The Caprician has left for Geonosis. Eve stepped onto the command bridge, Dudop was nearby and still under the eyes of the droideka guard. Although she didn't say it, her Supercomputer accessed the Geonosian Space Station's records, downloaded all the video footage, uploaded creative footage, and wiped Dudop from all records, and placed him on the re-assignment list...under a department that the Rebellion wouldn't miss him. Janitorial Service, freelance. "You've been reassigned." she accessed the Caprician's databanks, and retrieved training protocols and programs that would be available for his cause. "We leave for training immediately. Any questions before we depart?" The Caprician is at the edge of the Geonosian Sector, ready to depart for Military Training Grounds 9490-4942. "Well, just one. Why do all these droidekas seem to... like me so much? Oh, and cool ship." What does an Apex actually look like? Oh... should have known that's what that was. Thanks. "The destroyer droids have been ordered to watch, and protect you until the completion of your final training." Eve approached one of the motionless droids, her fingers gliding over the destroyer's head piece. "This one was Lady Arlyn's favorite. He served with her during several tactical engagement missions, and was present the day Boba Fett, and Jase Denora slaughtered her fiance." Her affectionate touch was noteworthy, but she soon collected herself, and accessed the ship's navigational computer. They were above the time line schedule. Impressive. "We're about to arrive at the Rancor's Nest... a training site, only the selected few will ever see." The Caprician dropped from hyperspace, the snowy orb appearing on the viewscreen. " Standard procedure indicates the Senior Commander, which in this case, is myself, communicates entrance/clearance codes, before any further communication, or landing begins. There will be a shuttle prepped for our immediate departure, and I want you to wait for me there." She wasn't lying, but she needed time away from him to handle a personal matter. Sark was a loose cannon, and this time, he was attacking the Anzati homeworld. He was ordered to provoke the Empire, not to annihilate them. What was he doing? she thought. As Dudop disappeared, she connected into Ryan. "Sark needs to be shut down, especially with Arlyn in the heart of Imperial territory. She would be the first they blame." he said instantly, and by the tone of his voice, and the corresponding algothrims, Ryan dismissed her concerns for Sark's continuing activation. "I understand." Eve answered, "He has reached the point where return becomes difficult, and almost irreversible. I will shut him down, and seal him in the Room of the Seven Galaxies." Artemis, the fateful droideka, followed carefully behind her.... despite Ryan's hatred for his replicated brother, she wasn't sure if this was entirely necessary. It was, however, the will of the Davads'. Ryan boarded the Caprician, the emotion that he generated, and felt, pulsed through him as visible as any human. His demeanor was dark, the events overshadowed him, and the only beings that dare approach the fleet commander, were artificial, non-sentient droid reports. The loss of the Librianna and the sensitive data it possessed was something more than he could bare to explain. "Dudop." Ryan approached the shuttle where he was waiting, "I want you to take this shuttle directly to Denon, and speak with Leia Organa Solo herself. It's time the Davads and Solos come together. We are, afterall, on the same side." He handed Dudop a classified document, that only the Chief of State's access codes, would be able to unlock. Ryan twisted, and turned. He wished to speak to Eve about the security breach Coronus now faced. The bridge was silent, the artificial droids were clinking away, Eve's supercomputer must've silenced them, and using the droid control ship's relay systems, she disabled their vocal communications. She too, understood the danger that laid ahead. It had been nearly a day after Sark's departure, and who knows what he planned. "My Human Replica Droid embodiment has been secured, Ryan, but once he attacks, we will both go offline. I cannot say how long she will remain active." Eve spoke as though she were the supercomputer itself, versus articulating as though the HRD was a separate component, "There is little time to save the files, the infrastructure, and the data that I have collected. I am trying, but I will fail by a large margin." "Ryan... there is something I wish to say. I have analyzed trillions of files, and trillions of ways to execute the phrase that I believe I wanted to feel, but due to the programming, and the nature of my existence, I was not allowed, nor could I evolve to feel so. It's a phrase that is spoken frequently to some, and not enough to others. A biological phrase, that artificial programming rarely comprehends." Ryan held her, his tears softly splashing against her clothing as he collapsed to his knees. He screamed for assistance, gently laying the woman across the bridge's command deck. In a single flick of wrists, the fleet jumped away from it's engagement location. "Eve!" Ryan called into the darkness, "Eve!" For the first time since her creation, she could not hear him, and maybe more importantly, he could no longer hear her. Dudop tried to open the file, just because. When it didn't work, he held it up to the light. Whatever. He got into the shuttle. Placing the document in the glovebox for lack of anyplace better, he activated the repulsorlifts of the shuttle and closed the doors. In the wrong order. That's funny, I thought they didn't trust me. The little shuttle came out of Caprician's hangar and into empty space. Dudop is now going to Denon. Oh, and I assume the droidekas are in the shuttle with me.